The University of Leicester was founded in 1921 in the aftermath of World War 1. The men and women who created this new institution hoped that it would be not only a living memorial to the past, but a beacon of hope for the future. Their aim was that education and research would change the world for the better. Today the University of Leicester is a lively, creative and global community, committed both to undertaking research that saves, improves and enriches lives, and to fostering a teaching and learning environment which transforms the prospects of its graduates. The University of Leicester is ranked 159th in the world out of 1000 institutions listed (Times Higher Education 2018 World University Rankings), and has on three occasions been awarded the Queen’s Anniversary Prize for Higher and Further Education - the highest form of national recognition open to a UK academic institution. The university is committed to sustainability, and all new developments are designed to be as environmentally-friendly as possible, including elements such as solar panels, rainwater harvesting, sustainable materials and natural ventilation. Biodiversity is important, too, with more than 400 species of wild plants and animals recorded on university property. The University of Leicester occupies an attractive campus in the city of Leicester, 100miles north of London. The rail station and city centre are a short walk or bus ride from the campus. Located in the East Midlands region in the center of England, Leicester is easily accessible from other parts of the country: London is 70 minutes away by train and Birmingham a journey of less than an hour. Using the Eurostar connection at London St Pancras International station, Paris, Brussels and other European destinations can also be reached by train. Birmingham International is the nearest airport offering both direct and connecting intercontinental flights. A number of low-cost airlines serve a wide range of European destinations from East Midlands airport. Leicester is the UK’s tenth biggest city with a population of about 300,000. The city is proud of its diversity and celebrates many different cultural events and festivals. Leicester is a student city: during term-time students make up 12 per cent of the city’s population. Whether it’s shopping, eating out, nightlife, museums, entertainment, music or sport, Leicester has all the facilities and attractions of a major city together with a friendly and safe atmosphere. The University of Leicester encourages all new international students to attend the International Welcome Week immediately before the start of the academic year, which provides an excellent opportunity to settle into a new way of life and meet other students. The award-winning David Wilson Library, opened by Her Majesty the Queen in 2008, provides an excellent study environment, including hundreds of PCs, wireless access throughout, group study rooms, graduate study area, staffed and online Help Zone, together with a bookshop and café. The Students’ Union offers a host of services and opportunities to inspire and entertain students. Facilities include a 1,750 capacity entertainment venue, shops, cafés, a bank and student advice center. The Union supports over 150 societies, campaigns about issues that matter to students and cares for students’ safety and welfare. The university has two modern and well-equipped sports centers, each with a swimming pool, located on the main campus and the Oadby student village. The Career Development Service offers professional guidance for undergraduates, graduates and alumni. In the 2015 Graduate Development Awards, the Association of Graduate Recruiters has recognized the University of Leicester as the best institution in the UK for its overall strategy to prepare students for the world of work. Students at the University of Leicester have a wide choice of accommodation, so that they can choose a place to live that best meets their individual needs and budget. The university guarantees an offer of a place in university-allocated accommodation to all new single students, both undergraduate and graduate, who apply by 1 September in the year they plan to begin their studies. Accommodation booking is managed through an online system. Students can express a preference for a particular location and room type, but this cannot be guaranteed. For undergraduates, the Oadby Student Village, located 2.5 miles from the campus in a leafy, pleasant suburb of Leicester, provides an attractive environment in which to work and relax. Students can choose from catered halls of residence or self-catered accommodation, with a range of room types, from standard single to en suite (private bathroom). Graduate students can choose between self-catered accommodation in university halls or privately- rented accommodation. The Students’ Union at Leicester provides support for students seeking privately-rented accommodation through SULETS, a lettings agency jointly owned and run by the Students’ Unions of the University of Leicester and De Montfort University. For more information about applying to Leicester University, please contact one of our Across the Pond Advisors. 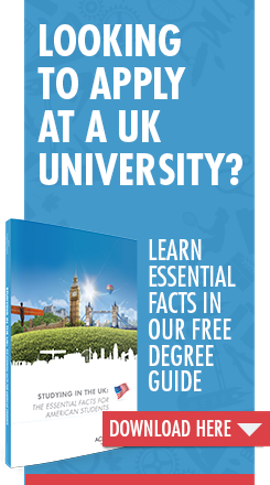 Considering the UK but not sure exactly which field to study? The University of Leicester has a wide range of major/minor options that might offer you exactly the right match. A high quality learning environment along with the huge advantage of overseas study coupled with a flexible variety and balance of subjects. What more could you ask for? Contact us to get a free personal advisor to guide you all the way.